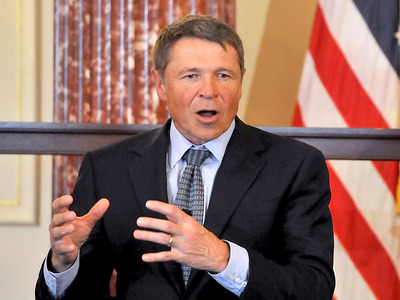 Larry French/Getty ImagesRetired Yum Brands CEO and chairman David Novak. Growing up in a series of trailer parks across the Midwest, David Novak never envisioned himself as the head of a billion-dollar company. As the CEO of Yum Brands from 1999 to 2015, Novak turned a PepsiCo spinoff into a global leader in the fast-food industry through the brands KFC, Taco Bell, and Pizza Hut. When he retired from his position as chairman of Yum in May, he left behind a legacy of 41,000 restaurants across 125 countries and a market capitalisation of about $33 billion. Novak recently visited Business Insider in New York, where we discussed his new book, “O Great One!” and the greatest lessons from his career. He explained that even though he could have never predicted where his life would take him, his unusual childhood provided him a key skill for becoming an effective leader: empathy. Novak was born in Beeville, Texas, in 1953. His father was a land surveyor for the federal government, which required him and his team to live with their families in trailers, since they would have to pack up and relocate every few months. By the time Novak’s father got a promotion that allowed him to settle down in a house in Kansas City when Novak was in sixth grade, Novak had lived in 23 states. In his 2007 business memoir “The Education of an Accidental CEO,” Novak wrote that though he spent his childhood in a cramped trailer, the negative associations with the phrase “trailer park,” of “kids in ratty clothing and weeds growing out through the trailer wheels,” as he wrote, didn’t apply to the way he grew up. Instead, he was part of a close-knit, supportive community. But his beginnings were still humble, and he remembers his first real bedroom being bigger than the entirety of his trailer’s living room. He told us that these experiences helped him as the head of a fast food empire, which employs many people in low wage jobs. In every trip to one of Yum’s restaurants around the country, Novak would have conversations with employees and give out pins of recognition to those he felt were doing an exceptional job. He would make note of what he learned from the people on the front lines and bring it back to his executive meetings. It taught him the importance of venturing outside of a C-suite bubble or the bubble of his own ego, and of connecting with the people who power the company. “I’ve always believed you don’t look up when you’re dealing with people, you don’t look down, you always look straight ahead, eyeball to eyeball,” he said. He’s never forgotten his working class background.